The end of baseball season can be a gloomy time for everyone. The transition into cooler weather and the changing of the seasons into fall can be tough for anyone who enjoys spending their spring and summer days on the baseball field. While these changes signify the end of the baseball season, they don't have to signify the end of sports participation for the year! There are many benefits to playing multiple sports throughout the year. Playing the same sport every day for extended periods of time, like over the course of a year, can quickly lead to burnout. Burnout in a sport is when the athlete is mentally fatigued from playing one sport too often. When athletes play one sport too often and too early on in their lives, it can result in the athlete losing the fun aspect of the sport. The athlete will then want to stop playing because they are tired of it, and it's just not fun anymore. The sport turns into work, and they begin to resent going to practice or games. Playing in year-round ultra-competitive leagues can put a great deal of pressure on young athletes, causing them to become resentful. It is important to remember that kids play sports because they are able to have fun with their friends, they enjoy playing, and they like to compete. These three things are the drivers of youth participation in sport. Too many young athletes get burned out because the focus on these simple drivers are lost when the athlete plays one sport for an extended period of time. By taking a break from one sport to play another, athletes are given more of a variety, as well as different situations and they are able to continue playing sports because they are more likely to enjoy them. Overuse injuries go hand-in-hand with burnouts. If athletes play one sport year-round, they are constantly using their growing bones and muscles in the same way. With there being no variety in movement and muscle development, the muscles and bones that are being frequently used can begin to wear out from overuse. The repetitive motion of the same game year-round, doing the same skills and drills, often leads to overuse injuries such as stress fractures, strains and sprains, and even tears in muscles, tendons, and ligaments. 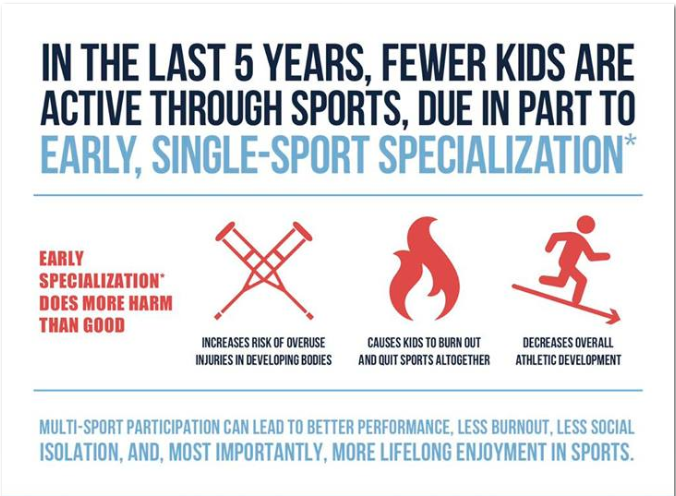 The more sports and activities that kids are involved in early on in their lives, the more opportunity they have to develop themselves as an athlete, not just as a baseball, soccer, basketball, or football player. Many skills and techniques transfer from one sport to another and complement each other while continuing to further develop and build upon preexisting skill sets. When athletes develop their skills across different sports and activities, they are likely to find that their performance in other sports will increase. For example, both baseball and soccer involve running. In baseball, you run around the bases and after balls that have been hit when you're on defense. In soccer, you run up and down the field passing the soccer ball back and forth trying to score. Running in baseball is usually more explosive over short distances for short periods of time, while running in soccer is more endurance over longer distances for longer periods of time. If an athlete plays both baseball and soccer, they will develop both explosive and endurance running skills. The endurance running skills can help in baseball if they hit a triple, and the explosive running skills can help in soccer if they are trying to steal a ball back from an opponent. The combination of the two skill sets make for a better all-around athlete. Playing multiple sports can help kids build important life skills such as problem-solving, teamwork, communication, and responsibility. While playing one sport also teaches valuable life lessons, playing a variety of sports allows for lessons to be taught and learned in different environments, which helps teach adaptability and openness to change. Playing different sports provides a great opportunity to be exposed to new team roles and become a well-rounded player. For example, a player who is a star on the baseball field might find it beneficial to play in a different role in basketball. Sport is a great vehicle for building self-confidence in youth. With each different sport, there are different levels of success that athletes can achieve, both big and small. Whether it is making a free-throw or hitting a single, each step of the way in sports holds a new chance for success. As athletes succeed in sports, their self-confidence increases because they start to understand they can overcome any obstacles that may stand in their way, both in sport and in life.